So I have finally found the time to sit down and write a few words about the week just passed. And I think the word of the day is Saison. The week started with a good old fashioned bottling session. With our collaboration Saison we brewed with Ingemar from Sad Robot. Unfortunately no sign of Ingemar on bottling day. As mentioned in last weeks blog, there are 2 versions of this. The standard Saison 42, but then a version we call Saison 42e that has been primed with elderflower cordial. We bottled just 255 500ml bottles of this and 6 key kegs, half of which will be going to Sweden. So if you are lucky enough to spot any of this I would grab it while you have the chance. There's plenty of the original Saison 42 to go round though. Saison 42 was the beginning of a bit of a Saison season for us. Normally we use a dry yeast as our house strain, but this time we splashed out on some freshly cultured saison yeast. This stuff wasn't cheap, so we are going to get our monies worth here. So the very next day, we brewed another saison, this time one of our core line up, Saison 14. There is a great story behind the naming of this beer, but I will leave that for the beers own blog. This beer took off like a rocket, coming down 14 points in just 24 hours, and is pretty much ready to bottle. So we just need to look at our schedule, crash cool it and get it into some bottles. But our saisons wont be finishing with that. Hopefully in the coming week or so we will be inviting our friend from Elusive Brew to brew the next in our Single Hop Series, and our second collaboration on our own kit. 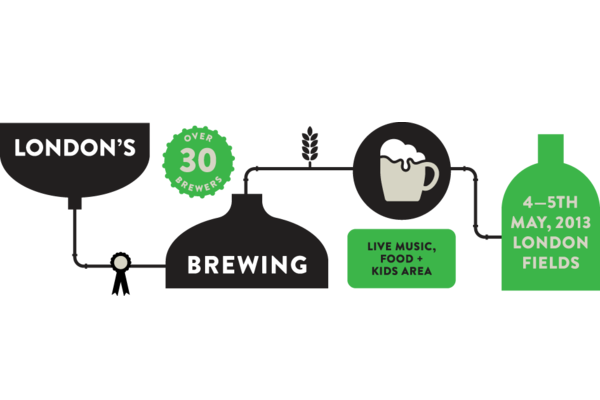 Nelson Saison will be, as the name may suggest, a saison hoped with just Nelson Sauvin. And im sure any brewers out there will know how hard that hop is to get hold of, so we are extra excited about this one. 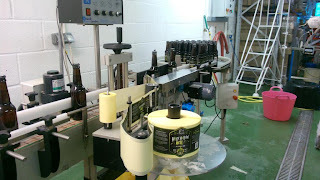 A lot of the week was spent sending bottles through our labelling machine. 5 o'Clock Shadow was all finished last week, with Fade To black all done and around 50% of Holy Hoppin' Hell all ready to go. So if any of our customers are interested in any of these new beers, please give us a shout. The week drew to a close with a number of new beers making debut appearances at 2 beer festivals. 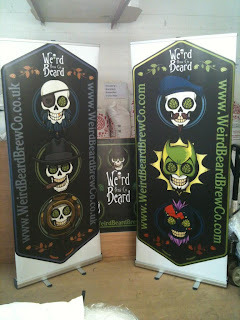 Firstly we had 3 beers, 2 of which new, at the Reading Beer Festival. Here we had one of our favourites Black Perle, but also one of very few casks of Holy Hoppin' Hell, along with Fade To Black, our black IPA. 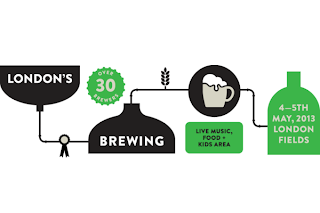 We also had 5 beers, and a brewer at the new LBA organised London's Brewing Festival at the London Fields event space. Here we had Black Perle on cask all weekend, Mariana Trench and 5 o'Clock Shadow in keg during the Saturday morning session. Unfortunately, Mariana Trench was not Mariana Trench for the majority of this session, and the trade session the day before. This was sorted out, but not until quite late into the session. So apologies to anyone who may have sampled this, and not got the hoppy pale they were expecting, but were greeted with a pilsner instead. Both of these keg beers sold out during the Saturday morning, so sorry if you did not get the chance to try them. Bryan was about for the morning session too, and got a chance to speak to a lot of interesting people. I was meant to be doing a meet the brewer session at 12:30, but as there were delays in opening this session, I was not inside in time. Sunday saw Holy Hoppin' Hell and Fade To Black on in the keg bar. These again sold out, so agian apologies to anyone who missed out. Neither Gregg or myself could be there for the Sunday session, as Gregg was delivering beers up in Manchester, and I was filling casks and Kegs with Hit The Lights. We also got some really cool looking branding items, so you wont be able to miss us at future festivals and events. All views and grammatical errors are those of @WeirdBeardBrew.